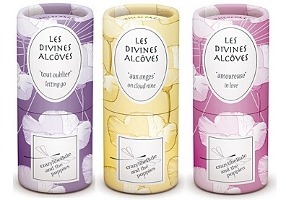 Last Friday I talked about Vanilla Moka, Vanilla Macarons & Vanilla Pralines, three fragrances from the vanilla-based Poule de Luxe collection by Crazylibellule & The Poppies; today, I'm trying out the Les Divines Alcoves collection. Like the others from the line, these are solid perfumes done up in adorable little twist-up containers with colorful paper wrappers, and like the others, they are unbelievably well done given the bargain basement prices: $16 for 5gr. Les Divines Alcoves comprises 7 fragrances inspired by "stories of love". Aux Anges / On Cloud Nine, with notes of bergamot, tangerine, ylang ylang, jasmine and white flowers, was my early favorite of the group. As Victoria has already pointed out at Bois de Jasmin, Aux Anges is very much in the vein of Christian Dior Diorissimo. As in Diorissimo, the lily of the valley opening is a bit sharp, but it settles to a lovely blend of jasmine and lily of the valley, lightly accented by green. It is sweeter than Diorisismo, and lacks the crispness and sparkle that render Diorissimo, to my mind, the very personification of spring. Still, Aux Anges is very pretty and wearable, and the lasting power is quite good — I will be happy to have one in my purse. Amoureuse / In Love has notes of pink pepper, black pepper, rose, tea, jasmine, musk, patchouli, sandalwood and vanilla. This is a pretty, casual-but-stylish sort of rose, with touches of pepper in the opening and a bit of warmth from the patchouli after it settles. It reminds me vaguely of Bond no. 9's Bryant Park, albeit softer, and without the tart fruits. Nice. Tout Oublier / Letting Go has notes of bergamot, tangerine, rose, ylang ylang, iris, violet, cedar, amber and musks. Tout Oublier is an iris fragrance, with something oddly unpleasant (almost plastic-y) in the top notes that made me dismiss it on the first try. It impressed me more on later wearings — it improves markedly as it calms (and it doesn't take long), eventually becoming a soft woody-earthy iris, more warm than cool, and far more elegant than you would expect from the price. Again, I am almost shaking my head in disbelief that it is as nice as it is for only $16. No, it is not nearly so lovely as Chanel 28 La Pausa, but if 28 La Pausa disappears on you as quickly as it does on me, you might find Tout Oublier the better investment. There is nothing in the Les Divines Alcoves collection that is likely to startle you by its originality; in fact, almost every scent in the set reminded me of something else. Still, as I said above, they are unbelievably well done given the price, and when you add in the portability and the fun packaging, they are very much worth having. I do hope we'll see more Crazylibellule and The Poppies collections soon. A woods collection? Or even better, perhaps, a collection built around spices? Anything but fruity florals, please. For buying information, see the listing for Crazylibellule & The Poppies under Perfume Houses. I really liked the Shanghaijava collection, mostly (the curry one was my least favorite.) The vanilla ones I'm less enthralled by … I'm reading these, do you think I'd love any of them the way I like the Encense Mystic or that silly Musc one? None of them seems to be calling out to me. Your recommendation for Encens Mystique was a definite success – I love it. Now I'm wondering which of these should be my next cheap treat…hmmm…the Tout Oublier pulls at me, although I have trust in your assessment of the plasticky top-note…hmmmmmm…. Personally, I think the Tout Oublier is worth the very short wait for the top notes to fade — at this point, it probably ties Aux Anges as my favorite although after 1 try, they were miles apart on that score. March, Encens Mystic is still my favorite of them all, so I don't know. Which is the silly musk one? Isn't there one more of these? Presque Nu or something? That's the one I was interested in getting, but it was missing from my local (German) online fragrance place. I wonder if it's not available outside France. Oh, I was curious to hear your opinion on the other four. Wonder if The Kiss was as unpleasant on you as it was on me. Musc & Patchouli — sorry, I'm terrible at remembering their names. That one was great. I even like the Litchi, the Blue Orchidee and the Lilas Spiritual. The Ananas one was a bit sweet for me, and the Ginger & Coconut was like falling headfirst into a plate of yellow curry and not in a good way. I second a suggestion for a collection built around spices! And leather! Different kinds of leather! Oh — didn't even try the Musc & Patchouli, and wouldn't be likely to like it (?) I liked Lilas, and need to try Ginger & Coconut and Ananas again. I was so taken with Encens that the rest paled in comparison. You aren't an iris freak so can't recommend Tout Oublier. Dans Les Bras is lovely but not me, not sure if it is you either but maybe. I've been trying to think of what it reminds me of, and it might actually be FM Therese, but have to try them together and see. The Kiss didn't interest me very much, so didn't take good notes — can only say it was dull. Toi Mon Prince I agree is a Flowerbomb sort of thing, so didn't love it because I don't love Flowerbomb, but can see it being a big seller since after all, more people probably like Flowerbomb than Diorissimo, right? Ack! Robin – Dans tes Bras smells like Therese?!? (Or Tout Oublier?) I'm so glad I ordered it! I'm wearing Therese today, actually. Still a top-tener for me. And March – I looooooooove the curry one. Love it. I'm saying that totally off the top of my head, so please don't hold me to it — but I did mean the Dans tes Bras. It's not really that patch-y. Not sure why I like it so much; it's very creamy, actually. If you hate it, pretend I didn't say that! Sigh … why didn't I take French? It would save me now from thinking “Dance with Bras” every time I see that name, which takes all the romance out of the name, somehow. What? What is this! Oh, my. Ok, you guys are taking me way too seriously. I've been trying to think of what it smells like (it does remind me strongly of something) and that popped into my head. Already covered with other stuff or would go try it now before anybody thinks I know what I'm talking about! Given the price and decent quality, I really don't care if they're wildly original or not. Tout Oublier is another one I think I'm going to need. And, like Marina, I hope for collections around both spices and leather. I don't necessarily need wildly original either, especially if what is being evoked is a scent worth smelling. yes, i was hoping to get your opinion on the one i wanted (not fact checking you)! ah well… they're kinda cheap enough to buy on a whim. but still, it would have been fun to read more…. yeah, I read that. thanks. wanted a second opinion!! i keep trying to convince myself i can like flowers, but i really don't very much (except for iris and violet, which i'm now drowning in). i should just give up and stick with woods and spices. i guess i'll wait for the imaginary spice series! because i lurve encens mystic. Seriously, it just didn't do anything for me. Didn't love it, didn't hate it, therefore don't have much to say about it. But — it is floral, and so not sure it will be what you're looking for. What can I say? Two of these are Very Very Good Indeed, and for this money – unbelievable! OK, the Toi Mon Prince is not my thing – that patchouli syrup effect is just what puts me off Flowerbomb and Angel But the Tout Oublier is just gorgeous; as you described, there's a fleeting impression of what smelled to me like wet newspaper, but this rapidly disappears…and I'm left with a quiet, elegant iris behind which lurks a hint of somethíng woody and/or papery. I really, really like this one…and it definitely is not a million miles from 28 la Pausa (which turned out to be my favourite from the Exclusifs). The Aux Anges is much stronger on me; there is lotv, but more than that I get a bright, clear jasmine. To me, this is an astonishing dead-ringer for Chantecaille le Jasmine, which is about 6 times the price here in the UK (and which I love but can't afford). I'm honestly stunned by the quality and elegance of these; if they charged two/three/four times as much, it wouldn't be a rip-off. Of course, they don't have the sillage of alcohol-based scents, but hey! at that price I'm more than happy to keep the experience personal. They don't morph into something cheap, and the Aux Anges lasted for ages on my skin. If anyone wanted to enjoy the fragrance world on a limited budget, this would be a superb line to invest in. So glad you liked them too! Agree entirely that Tout Oublier is not a million miles from 28 La Pausa. 28 La Pausa undoubtedly uses WAY more expensive ingredients, but Tout Oublier is lovely, and lovelier than many things that have done with more expensive ingredients, for that matter. OK, joining in very late here…today I sampled Hermes Hiris for the first time and I swear, on me it's so close to Tout Oublier I can't justify buying the Hermes. What a great cheap thrill! It really is. It got overshadowed by the Encens Mystic, but it's a great scent.